Oops - we don't appear to have a video for the s1220. speck of dirt will show as a green line running through the picture - this is more apparent if cropping after the scan. Overall a good scanner for bulk scanning. 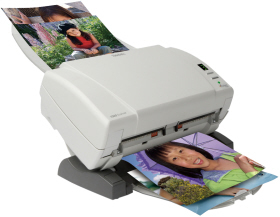 Compact, fast and powerful, the KODAK s1220 Photo Scanning System makes it easy to digitize your treasured old photos, postcards and even their old documents so they can be shared by e-mail, displayed, printed, output to digital media and more.